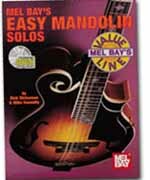 This book of original melodies is intended for the beginning mandolin student who can already read music or tab and play basic chords, but wants to learn new techniques and have fun in the process. In addition to its intrinsic musical value, each selection has a specific intent - teaching hammer-ons and pull-offs, crosspicking, the Phrygian mode, or some other essential musical or technical element. Accompaniment chords and performance notes are provided for each tune written in notation and tab. Mandolin chord diagrams further enhance this text to make it perfect supplement to any method book or private course of instruction. A companion CD is included at a great price!